I love spicy and fried food but too much of it recently made me feel very ‘heaty’ and I ended up falling sick and had a bad cough. So for the past week, I’ve been making and eating lots of steamed food and soups as well as herbal teas. This luo han guo with watercress soup combines two of my favourite ingredients (luo han guo and watercress) to combat heat-related symptoms. Luo han guo (罗汉果) is a dried fruit from the plant Cucurbitaceae (gourd) family, native to southern China and northern Thailand. For centuries, the Chinese have been brewing it as a medicinal drink to treat a variety of ailments as it has many health benefits. 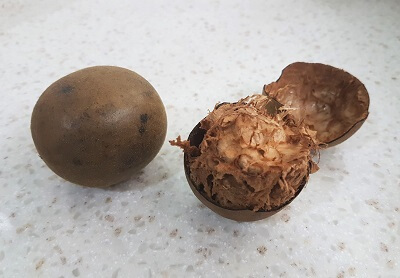 Also known as monk fruit, buddha’s fruit and arhat fruit, luo han guo is widely used as a natural remedy to soothe coughs, sore throats and clear heat build-up in the body. 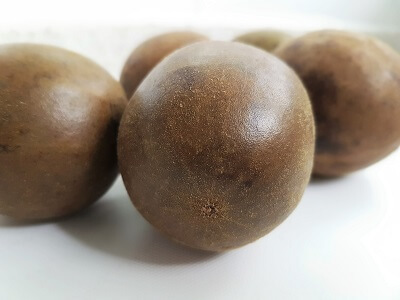 The luo han guo fruit is round, yellow-brownish or green-brownish in colour when they’re fresh. It has fine hair all over it and turns brown when dried. The natural sweet taste of luo han guo comes from chemical compounds in the fruit called mongrosides which makes it 300 times sweeter than cane sugar! Therefore, the addition of luo han guo to any soup or drink makes it sweet without the addition of sugar. Unlike regular sugar, it has zero calories and will not affect your blood sugar level even though it tastes very sweet. This makes it a natural sugar substitute for diabetics or those going on a diet. It is also used in Chinese medicine to sweeten soups. Before cooking, briefly rinse the luo han guo. Then crack the thin but hard shell with the back of a butter knife or you can cut it in half. Both the shell and the fruit inside can be cooked. Usually, I would use luo han guo to make a herbal tea but it can be cooked in soups too. Either way, it will serve its purpose to alleviate coughs and sore throats. Besides being an effective natural sweetener for food and drinks, luo han guo has many other health benefits. Luo han guo is used as a low-calorie sweetener to treat obesity and diabetes. In Chinese medicine, it is cooked in herbal teas and soups to treat coughs, sore throats and combat phlegm. 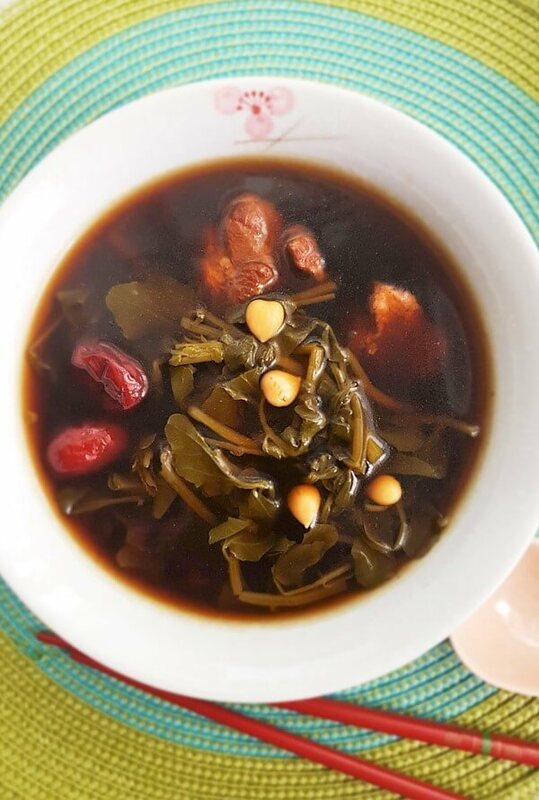 This soup is on the sweet side due to the dried honey dates and luo han guo. If you prefer a savory soup, replace the dried honey dates with a piece of dried tangerine peel. Dried apricot seeds helps to moisten the lungs and reduce phlegm. I usually add them into soups such as this Pear Soup with Pork Ribs whenever I have a cough and my throat feels irritated. They also add an interesting texture to the soup. Don’t want to miss a recipe? Sign up for Souper Diaries newsletter delivered to your inbox! Let’s connect on Facebook, Instagram, Pinterest, Twitter and Google+ for the latest updates. See you again and happy souping! Par boil pork ribs in a pot of boiling water for about 5 minutes to remove scum. Rinse luo han guo and gently crack it open with the back of a butter knife. Put in all the ingredients into a soup pot and bring to a boil. When it starts boiling, lower heat and simmer for 1.5 hours. The addition of pork ribs makes the soup savory but you can also boil it without the meat. 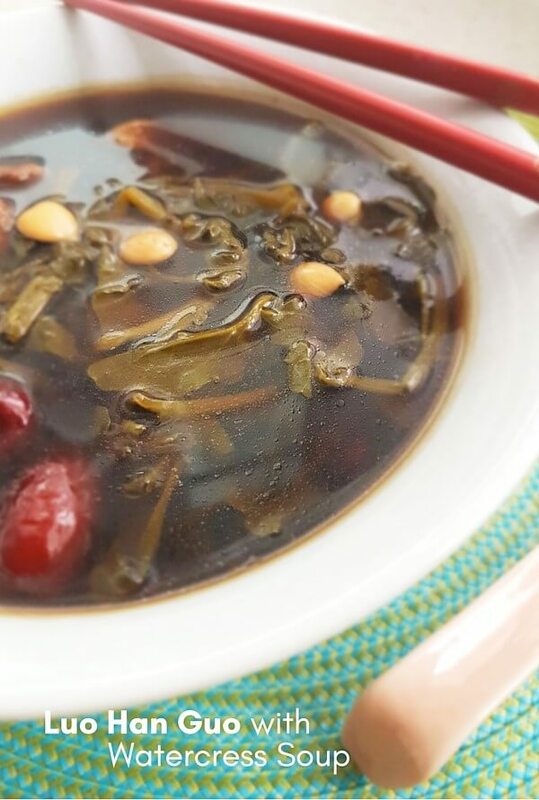 This soup is on the sweet side due to the dried honey dates and luo han guo. 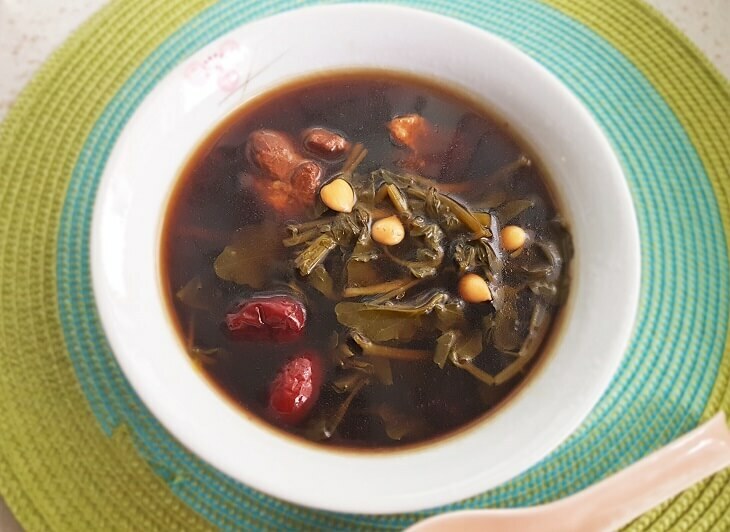 If you prefer a more savory soup, replace the dried honey dates with a piece of dried tangerine peel. Soak the dried tangerine peel to soften and scrape off the white pith on the inner skin with a teaspoon to remove the bitter taste. That is nice looking soup! Your post is very well written and I like the simplicity of the design. Do you recommend a soup for tummy upsets? Mine is giving me a lot of trouble this week. Thanks for posting this! Very informative article! The soup look very delicious. I want to try the soup to make my own, do you have a recipe that you can share or recommend to me? Thanks in advance! The recipe for this soup is at the bottom of the post. Do try it out! Wow. I really love this article. This definately sounds like something I am interested in. I used to use an anti-dampness tea I was reccomend to use to combat the same heat and cold symptoms but have been unable to find that tea for a few year at the local world market here. The monk fruit sounds about what I was looking for. So how do you make tea with it? You can make luo han guo tea (monk fruit tea) by brewing it with water alone or you can add any of the following: American ginseng beards (cooling effect), chrysanthemum flowers (cooling effect), dried winter melon strips or dried longan (the last 2 will sweeten the tea naturally).